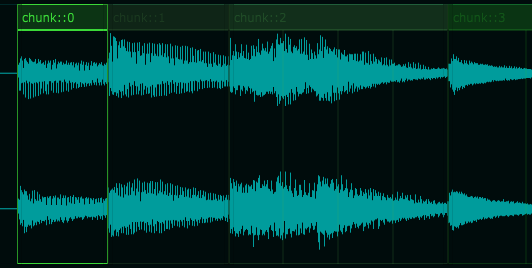 The Chunks Glue option is a way to cut your audio sample with some kind of auto adjustment of each slice. Let say you’ve loaded an audio sample and generated some chunks. You want to change some regions while maintaining the fact that they have to follow each other without creating gaps or overlap. In some cases regions overlapping may be wanted, otherwise until now you had to change every chunks one by one. Furthermore, you should have zoomed in to ensure that all those regions boundaries were exactly set at the right place. With the glue option enabled, chunks will be magnetized to each other. Therefore by changing the start point of a chunk, the end of the previous one will be automatically justified. Similarly, following the modification of the end of a region, the start point of the next region will be adjusted. This way, gaps or overlap will never occur.